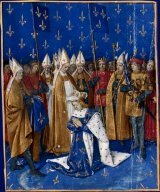 The crowning of King Charles VI of France. He suffered from a malady called “glass delusion”. Midas Crook spends much of his time taking photographs, preferring to view life through his lens rather than direct contact. Things change when he meets Ida Maclaird as he finds himself inexplicably drawn to her. Ida is a return visitor to St. Hauda’s Land, searching for the man who once told her a story about glass bodies in the bog. Unfortunately, Ida’s search is personal as she is turning to glass and wants desperately to find a cure. THE GIRL WITH GLASS FEET is a beautifully written tale that almost feels like it’s a legend or myth. Ali Shaw’s exquisite use of language draws the reader into a seemingly unbelievable world where obsessions abound and people turn to glass. The characters are odd but fit the world in which they reside. Ali Shaw does a good job at creating an atmosphere in which all of the elements flow together smoothly, maintaining a sense of magic throughout the tale. THE GIRL WITH GLASS FEET is a story I had trouble putting down as the beauty of the language kept me entranced. However, my reaction is mixed after the conclusion. Without a doubt, Ali Shaw has a talent with choosing words that draw vivid pictures but the story seems almost as if she is trying to do too much at once, leaving the reader with a sense that things are unfinished or something is missing. The magic exists but the reader is never told why nor is it fully utilized in the tale. Ali Shaw explores the deeper concepts of true love versus the appearance of love. The secondary characters provide an interesting backdrop to this as the story flashes backwards in time on numerous occasions, giving readers a real sense of who the characters are. Readers who like stories exploring images and how those images are interwoven into our lives will appreciate Ali Shaw’s style whereas those preferring a more conventional plotline may find it meanders just a bit too much..